Sightline EDM automates root cause analysis for DevOps and QA Engineers by incorporating big data and machine learning to quickly identify performance issues, correlate data from multiple sources and diagnose infrastructure problems throughout today’s modern cloud, virtual and hybrid IT environments. SysAdmins no longer have to spend hours troubleshooting performance issues or conducting manual trial-and-error tests to determine the root cause of a network outage, system failure or resource constraint. 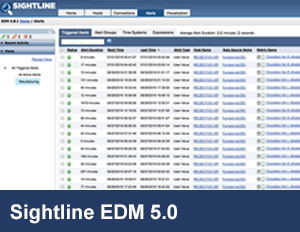 Within minutes, Sightline EDM allows IT teams to easily analyze event timelines, pinpoint root causes and prevent recurring problems. Trigger threshold alerts to provide an early warning as soon as problems arise to contain the damage, instead of waiting to address issues after the impact has spread. 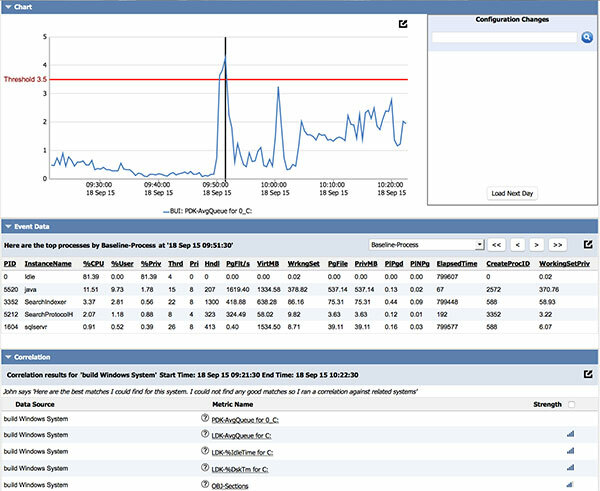 Quickly correlate, visualize and analyze infrastructure alerts and performance issues across all related systems to determine the root cause of an issue in minutes not hours. Easily add research notes and recommended solutions to any system alert to document performance issues, reduce response time and minimize recurring problems. Predict future performance issues based on past historical patterns to prevent recurring problems from requiring significant time and money to bring to resolution. 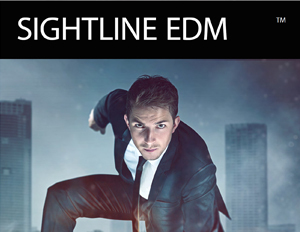 Sightline EDM allows your organization to proactively monitor the performance of your entire IT infrastructure, collecting real-time data on hundreds of metrics across thousands of systems. Sightline dramatically reduces the mean time to identification and resolution by quickly connecting the dots between first alert and final outcome. Sightline automates the root cause analysis process, correlating and analyzing alerts and events across all servers, applications and databases. Our advanced analytics engine helps IT teams identify root causes, address related symptoms and take corrective action to prevent problems from affecting customers, systems or services. Minimize the cost, duration and impact of expensive performance issues by quickly diagnosing the root cause of the recurring problem. 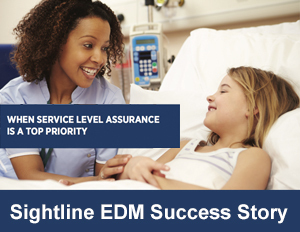 Sightline customers have saved millions of dollars in network outages, customer interactions and application downtime by relying on EDM to fix underlying issues instead of just treating ongoing symptoms.